Published: Dec. 11, 2012 at 02:40 p.m. Updated: Dec. 11, 2012 at 08:19 p.m.
Former NFL Commissioner Paul Tagliabue's decision Tuesday to vacate all suspensions for players involved in the New Orleans Saints bounty program will go down as a clear victory for the players and an embarrassing day for the NFL. » Is there closure in the bounty case? Tagliabue's strongest rebuke was ultimately aimed at the Saints' organization and coaching staff. In a carefully worded decision, Tagliabue affirmed Commissioner Roger Goodell's "factual findings" regarding Jonathan Vilma, Anthony Hargrove, Will Smith, and Scott Fujita, but Tagliabue believed the actions of the Saints players were worthy of fines, not suspensions. Tagliabue pointed to the players as relatively minor actors compared to the actions of the Saints organization. "Saints' coaches and managers led a deliberate, unprecedented and effective effort to obstruct the NFL's investigation into the Program and the alleged bounty," Tagliabue wrote. The Saints' organization, of course, was strongly punished by the NFL with a $500,000 fine, lost draft picks, and suspensions for coach Sean Payton, former defensive coordinator Gregg Williams, and General Manager Mickey Loomis. Tagliabue noted that Payton, senior coaches and other team officials all obstructed the investigation, and gave instructions to Hargrove to answer questions falsely. Tagliabue indicates that the suspensions for Smith and Fujita were somewhat arbitrary considering how many Saints players committed similar activities. 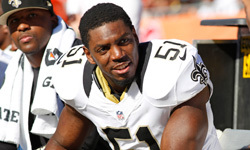 Take a look at the best photos of Jonathan Vilma. 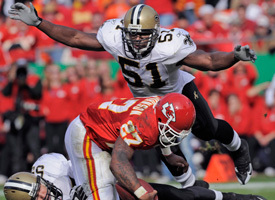 "Many other Saints' defensive players participated in the program similar to Smith without suspension," Tagliabue wrote. Tagliabue went out of his way to clear Fujita's name, saying that Smith, Vilma, and Hargrove engaged in "conduct detrimental to the integrity of, and public confidence in, the game of professional football." Tagliabue determined Fujita did not engaged in such conduct. He also considered reduced suspensions for Vilma, Hargrove, and Smith, but didn't even consider that for Fujita. Even though Tagliabue agreed with many undisputed facts associated with Vilma in the case, he ruled that the Saints' coaching staff was more responsible. "This entire case has been contaminated by the coaches and others in the Saints organization," Tagliabue wrote. This was a theme that Tagliabue repeated often. The Saints' coaching staff obstructed the entire case. "I strongly condemn the misconduct of the Saints coaches found by Commissioner Goodell and confirmed in the record developed during this appeal," Tagliabue wrote in his decision. "That severe misconduct played a substantial role in my deciding whether to sustain, in whole or in part, or vacate the discipline to be imposed upon these four players. "Equally, in vacating the players' suspensions I do not in any degree condone their behavior. I do not approve any of the misconduct in which Commissioner Goodell found the players to have engaged, though I do not find Fujita's conduct equivalent to the other players." Tagliabue goes on to say that the entire bounty saga paints all the Saints' executives, coaches, and players in a negative light. That's undeniably true. But Tagliabue's decision makes clear who he finds most at fault.